After a week worth of development, me and my buddy YeOldeDM have managed to put together a puzzle game. A game heavily inspired from Chip’s Challenge, an old and classic puzzle game. 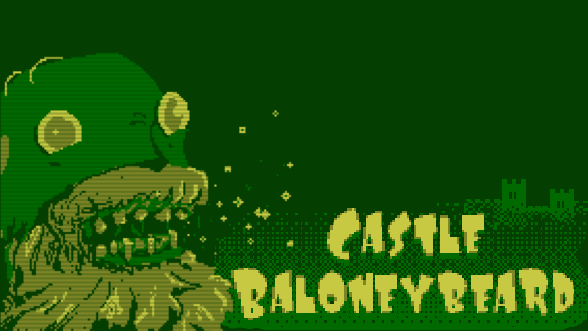 I only found out about #GBJAM5 a day or two before it started. There was a post on facebook that someone linked me, and it took me to this itch.io page. Knowing this in advance allowed me to check with the Godot Engine community and check if anyone would be interested working together on the project I had planned. Luckily, YeOldeDM volunteered as the artist. I already knew what kind of game I wanted to make. I wanted to make a game that would rival that of Chip’s Challenge. A simple and enjoyable puzzle game. This was all new to me, I have never worked on any puzzle games or even a game where the character is stuck to tiles. The games I’ve made before (ChickAttack and FlappyTurd) were more of a freeform game – I did not have to worry about player positioning. At most, FlappyTurd was restricted to the Y axis, meaning it could only move up and down, but the up and down movement was based on physics. I only had to “enable gravity” and apply an force directed upwards. Voilá! YeOldeDM began working on the player spritesheets and a name for our game. In the beginning, the idea was to make a game about Noah, where he had to collect animals and get to the “end”. However it got scrapped early. It just did not seem interesting enough. Okay, we all know the story of Noah. Big ship. Big ocean. Two animals of each species. Male and female. Ok.
Perhaps it was a bit too controversial, I don’t know. Let’s find something more interesting. Only a day or two after we’ve started to put the game together, YeOldeDM pumped out a new backstory for the game and came up with drafts. 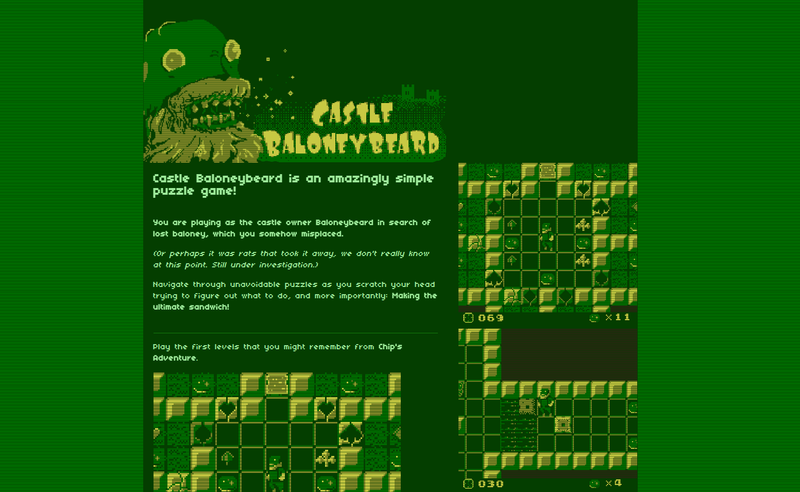 Castle Baloneybeard. A man looking for baloney to make his sandwich. I liked it. Let’s start with the basics. A menu screen. After implementing a simple menu screen I moved on to adding a test level. Since we had Chip to work from, I decided to use Chip’s first few levels in this game. Perfect for a gamejam, where time is limited. Using Chip’s first three levels I got to implement the core game features without having to worry or spend a lot of time designing levels. I would not have minded spending time designing levels carefully, but time is of essence! Focusing on gameplay. After some time, I begun implementing the player too. 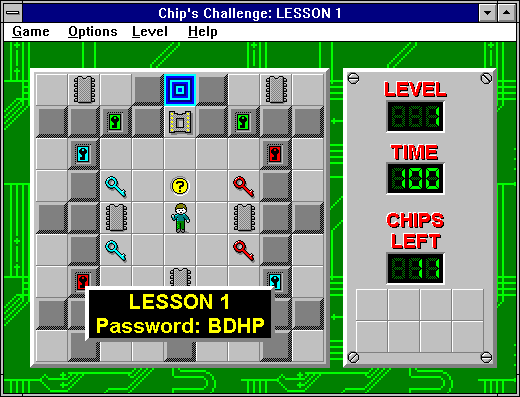 I had to make sure the player was “stuck” in position on each tile, and remain consistent with the way movement in Chip’s Challenge was handled. Luckily it was an easy feat to handle when we already know the tile sizes, which are constant. Which are 16x16px. We were talking about perhaps using 8×8 but decided it was a bit too small for the level of detail we wished to add. As time went on, and after getting more and more sprites to add to the game, more parts of the game were implemented. Pushing blocks. Water. Swimming. Dying. Dying. Did I mention dying? You can die here. During my time developing this, the greatest challenge – other than redoing all the code, after realizing I could improve the workflow and make it more predictable with a state handler… was the ice and slider blocks. These blocks job were to move the player along until the player is no longer on them. The ice works by sliding passing the player around using enter and exit triggers. In hindsight, the ice could have been implemented a lot better. This was a lesson I learned after adding sliders on the last day of the entry. Unfortunately, there was no time to clean and optimize the code at this point. We needed sound. We had no sound! How can the game be with no sound? I would not allow that to happen. The last two days YeOlde was incapacitated and I had to step in for both of us. I managed to find a great musician/composer called Ozzed. He have made A LOT of retro music which people can use freely as long as they credit him. The sound effects were from another source, and did not require any licenses, credits, permissions or otherwise. In the end though, we managed to pull it through. I had to stay up all night in order to finish it, until 7AM. I am very happy with the way the game got to be. There are of course plenty of possibilities to improve it. Possibilities I may take advantage of in the future. Download can be found on itch.io or gamejolt. I like gamejolt, but I like the page customization on itch.io a lot better. I might move over to itch.io because of this, but I don’t really know. If you have read this far, what are your thoughts on this? My next project is going to be the development of an offline productivity tool. When I say offline, I mean it will not require you to be connected to the internet. Planning to add cloud support, but more about this later.